Tell us about how you chose your name and number. Lucky #13! Freaks some people out, inspires others; I like the juxtaposition and it’s a little shout-out to my Jewish roots. And as for my name, I don’t take myself too seriously so I went with something comical. Vajanna was a middle school nickname. It’s the first two letters of my last name in front of my first name. Banana was just the perfect addition to make my name even more inappropriate . Of course now, I have an innumerable amount of quirky nicknames, all of which I adore. I’m not sure where derby will take me, so for now I’m a blocker. But adaptability allows for growth and I like surprising myself, and others... so definitely Pivot and maybe even Jammer might be in my future. 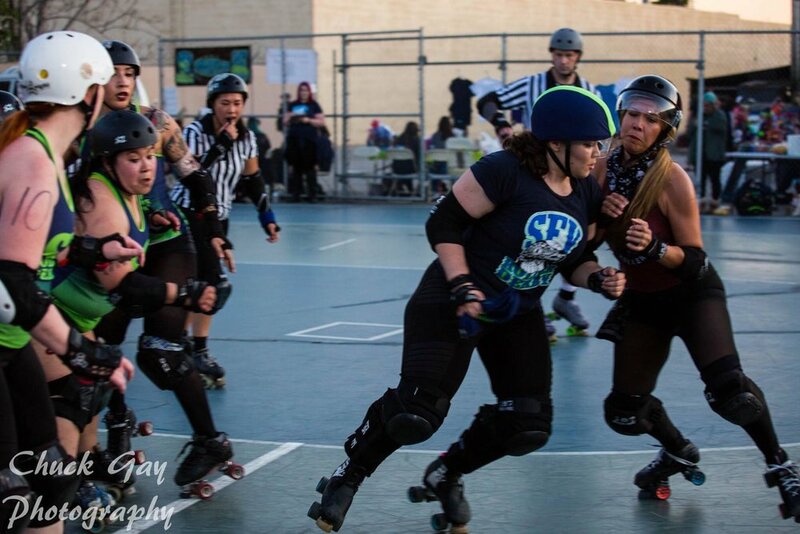 For now, I don’t see any limits (maybe naively); I keep finding new goals and inspirations from my league-mates and the world-wide derby community. Someone (sad that I can’t recall who because I would want to thank them) recently said I wanted to be indispensable and it stuck with me. That’s the perfect word and I love the challenge. There are way too many people on that list, but here’s a SparkNotes edition. If you’re a pivot or blocker on the OMGs or Wipe Outs, You inspire me. If you have the same body type as me, You inspire me. If you get past me as a jammer or can hold me back when I jam, You inspire me. If you create barriers and challenges for me to work through, You inspire me. If you juggle too many things in your life and still find time to come beat me up on the track, You inspire me. If you’re thinking you might be on my list, you’re probably right because You are inspiring. Roller derby is/was my light. Fear keeps us from a lot of incredible opportunities. Stop being afraid and just try it. If you fall, you get up and try it again. We all fall, what matters is that you get back up. Keep getting back up and stop comparing yourself to others; uniqueness is an incredibly invaluable quality.